Elegant hotel in renovated historic buildings, in the centre of Lucca. From Pisa airport we travel by road (30 mins) to the delightful, walled city of Lucca. This morning we visit two historic properties: Villa Reale di Marlia, an historic garden that once belonged to Elisa Bonaparte; and Villa Torrigiani, an elaborate villa set in a simple, formal garden. After lunch, free time to explore Lucca. Residenza d'Epoca. Architecturally unique, historic monument in unspoilt countryside. We drive (1.5 hours) to Florence and visit (subject to opening) one of the historic Medici properties to the north of the city, Villa di Castello or Villa Petraia. After lunch we visit the delightful garden of Villa Gamberaia, much appreciated by Edith Wharton, before continuing to Pieve a Castello (1 hour, 15 mins). We drive (35 mins) to visit Villa Geggiano, just outside Siena, with its elegant gardens, theatre and wonderful views over the city. Optional free afternoon in Siena, or return to Pieve. We follow scenic roads south to the villages of San Quirico (1.5 hours) and Pienza (25 mins), pausing in each to visit small, historic gardens. After lunch we continue (30 mins) to the superbly designed gardens of La Foce, creation and former home of writer Iris Origo. Return to Pieve (1 hour, 45 mins)... for a concert in the church before dinner. We drive (25 minutes) to Villa Vicobello, and visit the fine Renaissance garden built by Baldassare Peruzzi for the Chigi family in the 16th century. Optional afternoon walk (1 hour). 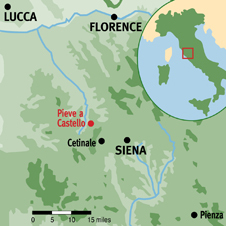 We drive (30 mins) into the wooded hills behind Pieve to visit the ‘Peruzzi’ gardens of the Castello di Celsa. From here, we enjoy a scenic drive through the Montagnola, with an optional walk back to Pieve (1.5 hours). Afternoon free to enjoy Pieve a Castello, before a gala dinner. Transfer to Pisa airport by road (1.5 hours). On this Tuscany walking tour you will have gentle, optional walks along easy paths - through vineyards, farm and forest tracks; plus garden visits and sightseeing. The fitness level of this tour is Grade 1. A wide range of traditional Tuscan cooking using inspirations from earliest times to the present day, together with local ingredients, and vegetables from the organic garden. An interesting variety of wines from various areas of Chianti, as well as Vino Nobile di Montepulciano and Brunello. White: Vernaccia di San Gimignano and interesting 'new whites' from elsewhere in Tuscany. The tour leader was extremely knowledgeable and professional and gave us plenty of time to look around the gardens. We did not feel rushed. The tour manager was warm and empathetic - nothing was too much trouble. A very balanced itinerary. I had not been to Lucca before and found it very interesting. Pieve was...a dream. provided with each itinerary. 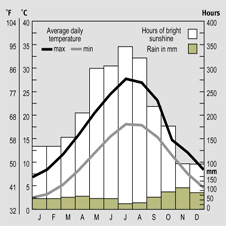 Early May is generally clear and warm, though there may be some lingering Spring showers. This is an 8-day trip, comprised of garden visits, sightseeing and gentle walks. The fitness level of this trip is Grade 1 . Please make sure that your footwear provides sufficient ankle support. We recommend you also bring lighter shoes for sightseeing. landscape characterised by medieval hilltop villages and scattered cypress trees, undulating vineyards and olive groves. Its gently rolling hills are disarmingly familiar as the classical backdrop of Renaissance art and its charm is a changelessness, which merges medieval and modern worlds. The destination airports for this walking holiday in Tuscany are Pisa and Florence. There will be a set meeting time at each airport for the transfer to the first hotel and a set time for the return transfer to the airport at the end of the trip. Please check transfer times with the Reservations Team before booking your flights if you would like to take advantage of the transfers. Your flight should arrive at at least 1 hour before the meeting time, to allow sufficient time to pass through customs and collect your luggage. Please ensure that you inform us of your arrival time at the airport, whether arriving by air or otherwise. If by air, please advise us of your flight number. The Tour Leader or Tour Manager will meet the group in the arrivals area at the designated time. They will be wearing green polo shirts bearing the ATG logo. The minibus transfer to Lucca will depart shortly thereafter. On our escorted Tuscany walking tours all meals are included. the trip, and also to cater imaginatively for those with special dietary needs. What sort of food in this area? Tuscan food is simple, using good local ingredients to complement the excellent robust wines of the region. It is seasonal food, usually prepared with home-grown ingredients. Although the Tuscans are called ‘bean eaters’ (mangiafagioli) the main staple of their diet, apart from pasta, is bread which is traditionally unsalted to complement the salted prosciutto, salami and strong sheep’s cheeses. Whilst it is a traditional cuisine, it is not a poor one and meat and game feature strongly, preferably cooked on an open fire. The Tuscans are less interested in the presentation of the food than in the excellence of the ingredients, and even the most elegant restaurants serve rustic terracotta bowls of rich vegetable and bean soups. The Tuscans also have a sweet tooth producing a variety of rich spicy cakes full of candied fruit and nuts, and delicious light biscuits. Tuscany for which San Gimignano is famous, and the delicious local dessert wine Vin Santo. probably find that in view of the walking you will appreciate the water more than the wine and therefore the better wines will be served in the evening. The destination airports for this walking holiday in Tuscany are Pisa and Florence. There will be a set meeting time for the transfer to Pieve a Castello; and a set time for the return transfer to the airport at the end of the trip. Please check timings with the Reservations Team before booking your flights if you plan to take the transfers. You are of course welcome to travel independently and meet the group at Pieve a Castello, however please ensure you arrive after 3pm.